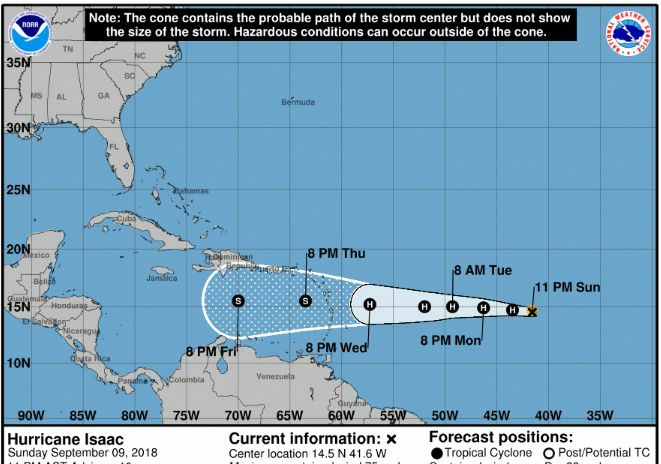 ROAD TOWN, Tortola, VI – Tropical Storm ‘Isaac’ has been upgraded to ‘Hurricane’ status and continues to pose a threat to the Territory, according to the Virgin Islands’ (VI) Department of Disaster Management (DDM), in an advisory issued on Sunday evening, September 9, 2018. Tropical Depression #9—one of three weather systems currently being monitored by the Department of Disaster Management (DDM), in the Atlantic—has been upgraded to Tropical Storm ‘Isaac’ and appears to have the potential of becoming an immediate threat to the Territory. The National Hurricane Centre as such, continues to issue advisories on multiple systems in the Atlantic. The focus is on Tropical Storm Isaac, as it has the potential of affecting the Virgin Islands later next week, DDM said. 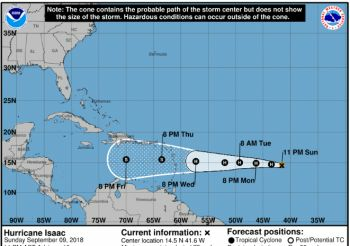 It was noted that residents and visitors should continue to expedite preparations as Tropical Storm Isaac is projected to be a hurricane upon approaching the Lesser Antilles. These hurricanes salting we meh bhoy. Stay calm. BVI islanders will know more about Isaac's forecast track by Tues. 9/11. Prepare yourselves and property. Don’t be in denial because this can happen in the blink of an eye. Have your water, canned goods, generator, etc. just in case. anyone would do this. DDM sends messages that show up on another cell frequency and no personal 'selfies'. Scary. I really hope not. Imaging all those two and three storage buildings with no roof or badly damaged roofs with people living or operating businesses below..There are a lot of those. Not favourable or can take another hurricane.. Chaos!!! My sister who resides in the US called me to say be prepared, they are about to get hit in a few days. The storm is growing stronger and stronger as it aim toward the Eastern Sea Board. She also said something about something heading towards the Lesser Antilles. Meaning if that happens, something is comming our way. It might seem easy to say but, you have to keep on moving. Just continue to do the best that you can. Grandma always said, we don't get more than we can handle.The main thing is being able to say thank you for another day. We are all going through a rough period but we have to continue to move on.